Vaccines Conferences committee look forward to welcoming participants to 36th Euro Global Summit and Expo on Vaccines & Vaccination (Euro Vaccines 2019) during June 03-04, 2019 in London, UK which will bring together world leaders in their respective fields in the fascinating environment of London, UK. Euro Vaccines 2019 conference features highly enlightening and interactive sessions to encourage the exchange of ideas across a wide range of disciplines in the field of vaccines and therapeutics. The conference includes explicit keynote talks from distinguished scientists, plenary sessions, Poster competition, Young Researcher sessions, Symposiums, Workshop and Exhibitions. There will be opportunities for those chosen to present at the meeting to publish a manuscript based on their presentation in the Journal of Vaccines & Vaccination or its sister publication, Journal of Clinical & Cellular Immunology and Immunome Research. Conference Series llc LTD organizes 1000+ Global Events inclusive of 300+ Conferences, 500+ Upcoming and Previous Symposiums and Workshops in USA, Europe & Asia with support from 1000 more scientific societies and publishes 700+ Open access journals which contains over 30000 eminent personalities, reputed scientists as editorial board members. Vaccines Conference brings together researchers, public health professionals and other key stakeholders to discuss progress and challenges in Vaccines research and development and implementation as identified in the universal Vaccines accomplishment. This event gives a chance for academic and health professionals to gain and share information on Vaccines research and development. We do expect this conference will be an opportunity to meet and gather with colleagues from different countries and other parts of London. 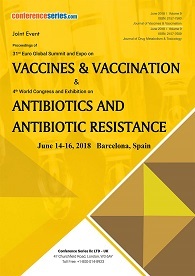 The aim of the conference is to provide an international platform for discussion and debate among Vaccines research and development providers, policy makers, academics and researchers on strategies and initiatives to achieve transformational and sustainable development in Vaccines research and development in local and global contexts. On behalf of Euro Vaccines 2019, we invite you to take this opportunity to join us for academic exchange and visit the city of London, UK. Euro Vaccines Conference is aimed to give an opportunity that with scholars from around the world focused on learning about Vaccines & Immunology and its advances; this is the best opportunity to reach the largest assemblage of participants from the Vaccines & Immunology community. It provide an explicit platform for presentations, distribute information, meet with current and potential scientists, make a splash with new vaccines developments, and receive name recognition at this event. World-renowned speakers, the most recent techniques, developments, and the newest updates in Vaccines & Immunology are hallmarks of this conference. A vaccine is an inactivated form of bacteria or virus that is injected into the body to simulate an actual infection. Because the injected microorganisms are 'dead,' they don't cause a person to become sick. Instead, vaccines stimulate an immune response by the body that will fight off that type of illness. It covers infectious disease targets and non-infectious disease targets. To generate vaccine-mediated protection is a complex challenge. Currently available vaccines have largely been developed empirically, with little or no understanding on how they activate the immune system. Their early protective efficacy is primarily conferred by the induction of antigen-specific antibodies. However, there is more to antibody-mediated protection than the peak of vaccine-induced antibody titers. Vaccine Development is an activity that focuses on a variety of technological initiatives and applied research, which enhance and promote improved systems and practices for vaccine safety. In the past year, the unprecedented Ebola disease outbreak galvanized research and industry response and as we continue to search for solutions, we must review the lessons learned in order to overcome the current challenges. Vaccines development is a long, complex process, often lasting 10-15 years and involving a combination of public and private involvement. The current system for developing, testing, and regulating vaccines developed during the 20th century as the groups involved standardized their procedures and regulations. Drug delivery systems are engineered technologies for the targeted delivery and/or controlled release of therapeutic agents. Drugs have long been used to improve health and extend lives. The practice of drug delivery has changed dramatically in the last few decades and even greater changes are anticipated in the near future. Biomedical engineers have not only contributed substantially to our understanding of the physiological barriers to efficient drug delivery—such as transport in the circulatory system and drug movement through cells and tissues—they have contributed to the development of a number of new modes of drug delivery that have entered clinical practice. Role of vaccine delivery technologies includes rational development of vaccines, achieving immunization goals, supporting best clinical practice. Vaccines continue to revolutionize our ability to prevent disease and improve health. With every technological advance, we are able to extend the benefits of vaccines to more people and provide better protection from life-threatening infectious diseases. Vaccines are the best defense we have against serious, preventable, and sometimes deadly contagious diseases. Vaccines are some of the safest medical products available, but like any other medical product, there may be health risk. Accurate information about the value of vaccines as well as their possible side-effects helps people to make informed decisions about vaccination. The safety of vaccines is carefully monitored, starting early in the product development and continuing for as long as the vaccine is being used. Find out about what is done before and after vaccines are approved for use and what is known about the benefits and safety of specific vaccines. There is a lot of false information about vaccines safety on the Internet. This can be confusing. Discover the answers to common questions and concerns about vaccines. Collaboration plays a major part in the success of Vaccines Business. This is exemplified in the relationships built, products launched and lives improved. Vaccines Business development: comprise a number of tasks and processes generally aiming at developing and implementing growth opportunities within and between organizations. It is a subset of the fields of business, commerce and organizational theory. Vaccine development programs face several challenges that set them apart from other types of healthcare product development programs. Vaccine adjuvants – is an ingredient of a vaccine that helps create a stronger immune response in the patient’s body. In other words, adjuvants help vaccines work better. Some vaccines made from weakened or dead germs contain naturally occurring adjuvants and help the body produce a strong protective immune response. However, most vaccines developed today include just small components of germs, such as their proteins, rather than the entire virus or bacteria. These vaccines often must be made with adjuvants to ensure the body produces an immune response strong enough to protect the patient from the germ he or she is being vaccinated against. Aluminum gels or aluminum salts are vaccines ingredients that have been used in vaccines since the 1930s. Small amounts of aluminum are added to help the body build stronger immunity against the germ in the vaccine. Aluminum is one of the most common metals found in nature and is present in air, food, and water. The amount of aluminum present in vaccines is low and is regulated by the U.S. Food and Drug Administration (FDA). An AIDS vaccine does not yet exist, but efforts to develop a vaccine against HIV, the virus that causes AIDS, have been underway for many years. An HIV vaccine could be effective in either of two ways. A “preventive” vaccine would stop HIV infection occurring altogether, whereas a “therapeutic” vaccine would not stop infection, but would prevent or delay illness in people who do become infected, and might also reduce the risk of them transmitting the virus to other people. Although a preventive vaccine would be ideal, therapeutic vaccines would also be highly beneficial. The basic idea behind all HIV vaccines is to encourage the human immune system to fight HIV. Observations in animal models have substantially advanced our knowledge of immune system adaptation, changes during the aging process, and age-associated degenerative diseases with autoimmune characteristics. Animal models provided early proof that discrimination of self (that which the immune system identifies as belonging to the body) and non-self (that which the immune system identifies as foreign to the body) is determined not entirely at conception, but, to a large extent, during early fetal development by a process called immune adaptation. The animal experiments confirmed the premise that immune adaptation is determined by the fetal or neonatal environment, rather than inherited. Animal models have substantially enhanced our understanding of the role of the immune system in tissue physiology and pathology. The knowledge gained from animal models offers hope for future modification of the human immune system to combat a number of disease processes. Vaccination given to children is called children Immunization. It is currently recommended that all children receive vaccination against the infectious diseases unless the child has special circumstances, such as a compromised immune system or neurological disorders. In our mobile society, over a million people each day people travel to and from other countries, where many vaccine-preventable diseases remain relatively common. Without vaccines, epidemics of many preventable diseases could return, resulting in increased - and unnecessary - illness, disability, and death among children. We have record or near record low levels of vaccine-preventable childhood diseases in the United States, but that does not mean these have disappeared. Many of the viruses and bacteria are still circulating in this country or are only a plane ride away. That’s why it’s important that children, especially infants and young children receive recommended immunizations on time. Vaccines can help keep you and your growing family healthy. If you are pregnant or planning a pregnancy, the specific vaccinations you need are determined by factors such as your age, lifestyle, medical conditions you may have, such as asthma or diabetes, type and locations of travel, and previous vaccinations. Benefits of vaccinating pregnant women usually outweigh potential risks when the likelihood of disease exposure is high, when infection would pose a risk to the mother or fetus, and when the vaccine is unlikely to cause harm. All women who will be pregnant (any trimester) during the flu season should be offered this vaccine. Talk to your doctor to see if this applies to you. Tetanus/Diphtheria/Pertussis (Tdap): Tdap is recommended during pregnancy, preferably between 27 and 36 weeks' gestation, to protect baby from whooping cough. A preventative vaccine is administered to a person who is free of the targeted infection. By introducing a part of the virus or an inactive virus (which acts like a decoy) into the body, the immune system reacts by producing antibodies. Preventive vaccines are widely used to prevent diseases like polio, chicken pox, measles, mumps, rubella, influenza (flu), and hepatitis A and B. In addition to preventive vaccines, there are also “therapeutic vaccines”. These are vaccines that are designed to treat people who already have a disease. Some scientists prefer to refer to therapeutic vaccines as “therapeutic immunogens. Immunotherapy includes treatments that work in different ways. Some boost the body’s immune system in a very general way. Others help train the immune system to attack cancer cells specifically. Immunotherapy works better for some types of cancer than for others. It’s used by itself for some of these cancers, but for others it seems to work better when used with other types of treatment. Vaccines that target blood-feeding disease vectors, such as mosquitoes and ticks, have the potential to protect against the many diseases caused by vector-borne pathogens. Vector-borne diseases are among the most complex of all infectious diseases to prevent and control. Vector- borne diseases, most of which are transmitted in and around the home, are best controlled by a combination of vector control (use of public health insecticides on bednets, or by spraying), medicines and vaccines. Historically, successful vector-borne disease prevention resulted from management or elimination of vector populations. Malaria was driven out of the USA and most of Europe in this way. Where vector control has been consistently applied in the past, the results have been dramatic, especially with early efforts to control malaria by spraying the inside surfaces of houses with insecticides. Indoor Residual Spraying (IRS) and long-lasting insecticide treated bednets have been very effective over the last 10 years and are widely regarded as one of the main contributors to the more than 1 million lives saved. Vaccines are an important part of routine preventive care for older adults, but most adults don’t get their vaccines as recommended. Omitting vaccination leaves adults needlessly vulnerable to severe illnesses, long-term suffering and death from preventable infections. Vaccines are recommended for adults of all ages, they are particularly important for older persons who are at great risk of serious debilitating consequences and death from infectious diseases. Vaccination is particularly important for individuals living in nursing homes or assisted living facilities, as disease can spread easily among people in close proximity. Veterinary vaccines are to improve the health and welfare of companion animals, increase production of livestock in a cost-effective manner, and prevent animal-to-human transmission from both domestic animals and wildlife. Several vaccine types can de distinguished among the second-generation veterinary vaccines, depending whether they are live or inactivated, according to the strain of rabies virus used and the characteristics of the cell substrate chosen for viral replication. More recently a third generation of live veterinary rabies vaccine has been developed using recombinant technology. Depending upon the expression system these vaccines are used either parenterally or orally. Oral rabies vaccines are widely used in foxes in Europe and in racoons in the USA. Most vaccines against viral infection are effective at preventing disease. However, they are not 100% effective for a number of reasons, reactions can occur after vaccinations. It is difficult for many of us today to appreciate the dangers of childhood viral infections. The vaccine becomes inactive due to incorrect storage, if used past its expiry date, or if incorrectly administered. Individuals unpredictably fail to produce an adequate immune response to the vaccine. Vaccine immunity “fades” over time. The different vaccine combinations at each time point do not interfere with one another and there is no increased risk of serious side-effects when they are given at the same time. Bacterial vaccines contain killed or attenuated bacteria that activate the immune system. Antibodies are built against that particular bacteria, and prevents bacterial infection later. Most vaccines against bacterial infections are effective at preventing disease, reactions can occur after vaccinations. Vaccines are available against tuberculosis, diphtheria, tetanus, pertussis, Haemophilus influenzae type B, cholera, typhoid, and Streptococcus pneumoniae. Population protection by vaccination against infections has been one of the major achievements of public health and is of considerable importance in controlling respiratory diseases. Plant-based vaccines are recombinant protein subunit vaccines. Ideally, the choice of plant species used to produce the selected antigen should allow for oral drug delivery in the form of an edible vaccine. To date, the most advanced human vaccine projects have successfully completed phase I clinical trials, and animal vaccine projects have given promising data in early phase trials targeting specific animal species. The plant-based vaccine production method works by isolating a specific antigen protein, one that triggers a human immune response from the targeted virus. A gene from the protein is transferred to bacteria, which are then used to “infect” plant cells. The plants then start producing the exact protein that will be used for vaccinations. The flexibility of the plant expressed vaccine system, combined with its low cost and ability to massively scale may provide vaccine protection not only to citizens of the United States, but to many parts of the world that cannot currently afford vaccines. Other uses of plant expressed vaccines including the successful creation of edible bananas that protect against the Norwalk virus. DNA vaccination is a technique for protecting an animal against disease by injecting it with genetically engineered DNA so cells directly produce an antigen, resulting in a protective immunological response. Vaccination consists of stimulating the immune system with an infectious agent, or components of an infectious agent, modified in such a manner that no harm or disease is caused, but ensuring that when the host is confronted with that infectious agent, the immune system can adequately neutralize it before it causes any ill effect. For over a hundred years vaccination has been effected by one of two approaches: either introducing specific antigens against which the immune system reacts directly; or introducing live attenuated infectious agents that replicate within the host without causing disease synthesize the antigens that subsequently prime the immune system. The field of DNA vaccination is developing rapidly. Vaccines currently being developed use not only DNA, but also include adjuncts that assist DNA to enter cells, target it towards specific cells, or that may act as adjuvants in stimulating or directing the immune response. Ultimately, the distinction between a sophisticated DNA vaccine and a simple viral vector may not be clear. Many aspects of the immune response generated by DNA vaccines are not understood. However, this has not impeded significant progress towards the use of this type of vaccine in humans, and clinical trials have begun. Anyone planning to travel abroad may need immunizations before departure. Although few immunizations are compulsory for international travel, some are recommended for the traveller’s protection. Some vaccines must be given in 2–3 doses several weeks apart. Therefore, a doctor should be consulted at least 2–3 months before departure. Children under 1 year, and people with a compromised immune system or serious underlying disorder may not be able to have some vaccinations, such as those for yellow fever and tuberculosis (BCG). Recommended vaccines are travel vaccinations that can protect you in areas where there is an intermediate or high risk for contracting certain illnesses. They also help prevent the spread of diseases from one country to another. Most infectious agents enter the body at mucosal surfaces and therefore mucosal immune responses function as a first line of defence. Protective mucosal immune responses are most effectively induced by mucosal immunization through oral, nasal, rectal or vaginal routes, but the vast majority of vaccines in use today are administered by injection. Immunisation involves the delivery of antigens to the mucosal immune system (dispersed or organised into units such as Peyer’s patches in the intestine or the nasal-associated lymphoid tissue in the oropharangeal cavity). The antigen delivery systems may comprise a simple buffer solution with/without adjuvants or an advanced particulate formulation, such as liposomes or nanoparticles. The most commonly evaluated route for mucosal antigen delivery is oral, but other routes have also been explored. Human Papillomavirus (HPV) vaccine is an inactivated (not live) vaccine which protects against four major types of HPV. These include two types that cause about 70% of cervical cancer and two types that cause about 90% of genital warts. HPV vaccine can prevent most genital warts and most cases of cervical cancer. Protection from HPV vaccine is expected to be long-lasting. But vaccinated women still need cervical cancer screening because the vaccine does not protect against all HPV types that cause cervical cancer. It is important for girls to get HPV vaccine before their first sexual contact -- because they have not been exposed to HPV. For these girls, the vaccine can prevent almost 100% of disease caused by the four types of HPV targeted by the vaccine. However, if a girl or woman is already infected with a type of HPV, the vaccine will not prevent disease from that type. The vaccine is also recommended for girls and women 13 through 26 years of age who did not receive it when they were younger. Vaccines Conferences advisory board invites all the participants across the world to attend “36th Euro Global Summit and Expo on Vaccines & Vaccination” going to be held during June 03-04, 2019 in London, UK. The Theme of the conference is "Focusing on novel strategies in Vaccines research and Development" will explore the advances in Vaccines and vaccination. 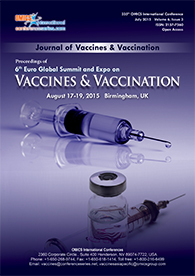 This conference could be an exceptional event that brings along a novel and International mixture of huge and medium cognizance on vaccines and vaccination, leading universities engendering the conference an ideal platform to apportion expertise, foster collaborations across trade and world, and assess elevating technologies across the world. Vaccination is a key to eradicate the diseases. It is a subject for the professionals who looks beyond the clinical prospects. Traditional approaches to vaccine design were to emasculate or inactivate the human pathogen or a cognate animal homologue, Vaccinology is the science of vaccine development and how the immune system responds to vaccines, but additionally includes perpetual evaluation of immunization programs and vaccine safety and efficacy, as well as surveillance of the epidemiology of vaccine-preventable diseases. This chapter provides a brief overview of some of the main concepts of immunology and Vaccinology as they relate to immunization. Euro Vaccines 2019 amasses all the extroverts under one roof of current advances. The global vaccines market is one of the fastest growing segments and new predictions estimate the value of the market to reach between $48 billion and more than $70 billion over the next five to eight years. According to a new report released by Transparency Market Research, the value of the global human vaccines market is expected to grow from a $28.3 billion in 2015 to $72.5 billion in 2024. The projection would represent a compound annual growth rate (CAGR) of 11.2% from 2016 to 2024. Even though the dollar figure is large and growing, vaccines still only account 3% of the market share within the global pharmaceutical industry. The report broke down expectations by segments. By age group, paediatric vaccines accounted for 57.5% of the share in 2015, but adult vaccines are expected to grow at a 13.2% CAGR during the forecast period. When the research group analysed the market by product, they found the pneumococcal segment to have the majority share in 2015, but expect hepatitis products to demonstrate strong growth through 2024. By vaccine type, the conjugate vaccines held the majority share in 2015, but the combination vaccines were expected to have the largest CAGR.